Here I perform a very similar analysis, comparing these two for-profit college networks with the public sector. Perhaps the whole postsecondary system is struggling and—if a critical appraisal were made—many public colleges would not fare much better than these for-profit chains. I emphasize economic criteria for evaluating colleges and the need to consider many such criteria to make a valid comparison. Therefore, I consider tuition and fees, expenditure patterns, default rates, earnings, and federal standards for colleges. Doing so will allow us to see how well public colleges as a whole compare to the performance of these two for-profit networks of colleges. One criticism of for-profit colleges is that they charge students excessive tuition and fees compared to public colleges. Figures 1A and 1B clearly show that public colleges charge thousands of dollars less in tuition and fees compared to ITT and Corinthian. Source: IPEDS (2013); 853 public colleges. Source: IPEDS (2013); 558 public colleges. Another criticism is that for-profit colleges disproportionately allocate resources to recruitment and marketing, spending little on instruction. This spending pattern may adversely affect student outcomes. By contrast, public colleges spend more of their resources directly on instruction. 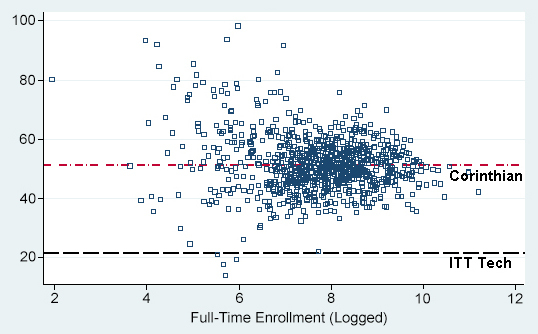 Figures 2A and 2B show that ITT’s instructional expenditures as a proportion of total expenditures were lower than almost every public college. Corinthian’s were about the same as average-spending colleges in the public system. However, public colleges allocate some expenditures to community and public service and research. If these allocations were extracted, public colleges would show considerably higher proportions spent on instruction. Source: IPEDS (2013); 934 public colleges. Source: IPEDS (2013); 564 public colleges. Many students in for-profit colleges default on their loans. Default hinders students’ ability to get jobs and establish creditworthiness, and debt service payments increase the price of college. 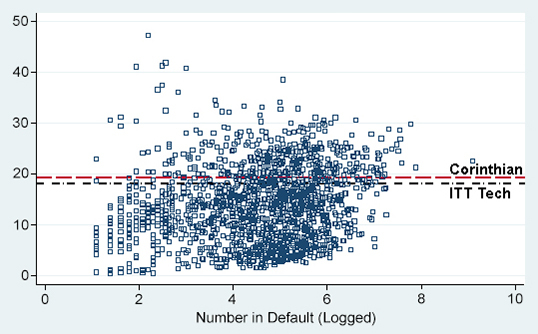 Figure 3 shows ITT and Corinthian cohort default rates that are higher than most public colleges. Source: Federal Student Aid data; 1,539 colleges. 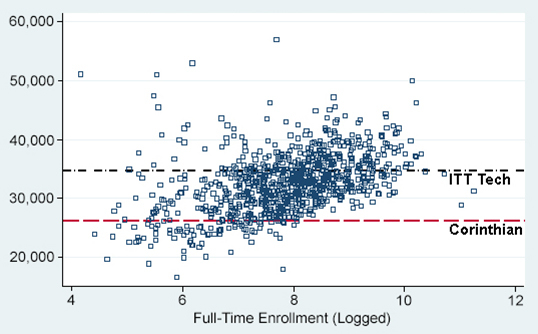 A critical test of the performance of a for-profit college is the post-enrollment earnings of its students. 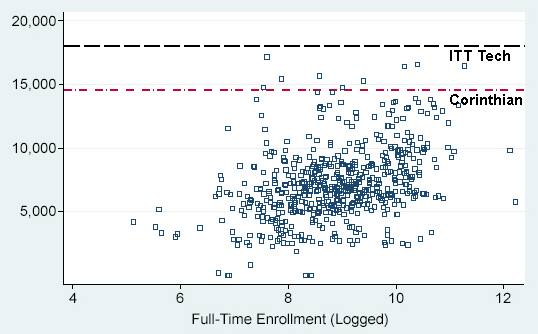 Figures 4A and 4B show that college-wide average earnings of Corinthian students were far below those of most public colleges. 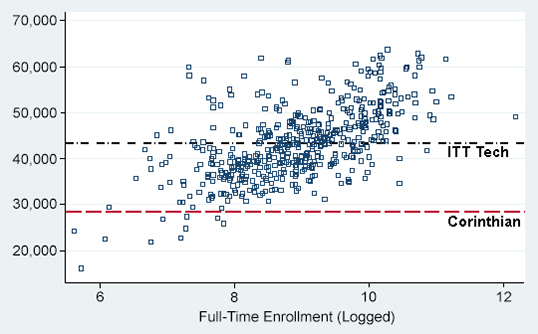 However, ITT students had average earnings that were around the middle of the public sector. Source: College Scorecard data (2015); 895 public colleges. Source: College Scorecard data (2015); 505 public colleges. Corinthian and ITT were chains of for-profit colleges. Perhaps for-profit chains exhibit worse performance than the public college sector in terms of regulatory outcomes. 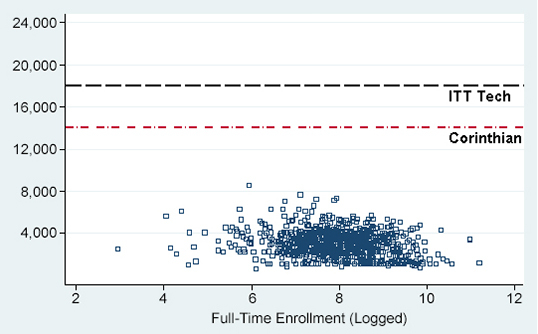 Figure 5 shows that chain for-profits are far less likely than public colleges to pass gainful employment standards. Public colleges are much cheaper than for-profit colleges. From a student perspective, this difference would have to be offset by a much superior performance of for-profit colleges to be advantageous. However, the evidence tends to point in the opposite direction. 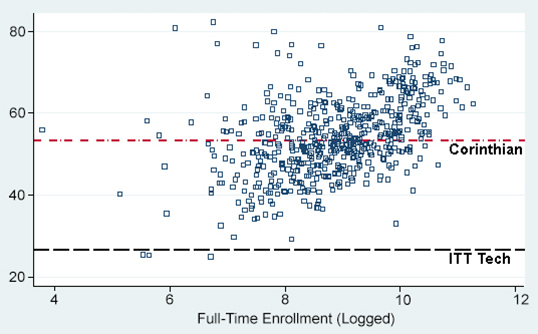 While ITT’s post-enrollment student earnings are comparable to those of many public colleges, on the whole the outcomes of public colleges appear to be better than those of the two closed for-profit networks of colleges.